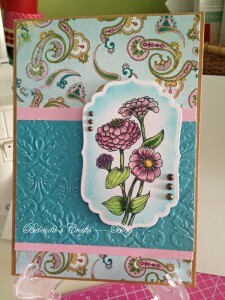 Ok, I am a big fan of Flourishes stamps and I admit it, I am finally taking the plunge and entering one of the Timeless Tuesday Challenges(TTC). The designers are so amazing and the entries for TTC are always beautiful. So I close my eyes and push submit! Beautiful card – love how you colored the flowers!! This is wonderful! I’m so glad you decided to play along with us this week! I love your coloring! Wow Belinda! Your card is stunning! Great colouring of your blooms. Thanks for playing along with our “Timeless Tuesday Challenge” last week. I hope you’ll join us again this week!